Kitchen remodeling: From adding more functional space to your kitchen to tailoring cabinets and closets to meet your spatial needs, we’re here to help personalize your kitchen remodel in a way that aligns itself with your needs and wants. Our experts have help customize kitchens for all types of homes and are talented when it comes to crafting the design elements you enjoy, whilst staying under budget and within your timeline. 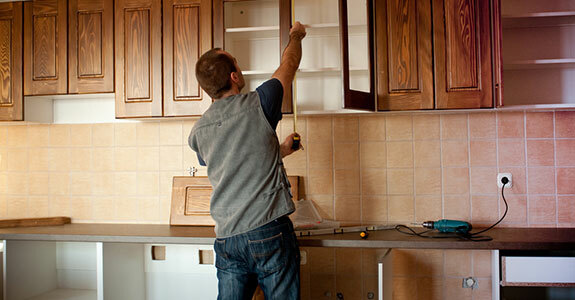 From complete remodels to targeted upgrades, we’re here to transform your kitchen for the better. Bathroom remodeling: Is your bathroom lacking class? Have you noticed that it feels more like a bathroom than another comfortable room of your home? We’re here to help transform your bathroom into your own personal sanctuary, where you can feel comfortable, welcome and accommodated, whether you’re showering behind new glass doors or brushing your teeth in the bask of new lighting and fixtures. Whatever your vision for your bathroom is, we’re here to help achieve it. Whole home alterations: If there’s any area of your home that doesn’t quite meet your expectations or falls short of what you need it to be, we’re here to help make sure that it’s tailored to meet your expectations. From expanding your closet to finishing your rec room, creating a home office to converting a bedroom, know that we have the experience and talent to make quick work of your home remodeling project and leave you with a finished product that’s exactly how you envisioned it in your head. Whether you’re looking to update your kitchen to a more modern environment or you realize the need for bathroom remodeling in Jacksonville, NC, Power Painting & Cleaning is here to help! Give us a call today at (910) 324-5960 for more information about how we can help you get started on your next home remodeling or renovation project and what can be done to make sure you’re crafting the living space you’ve been dreaming of.